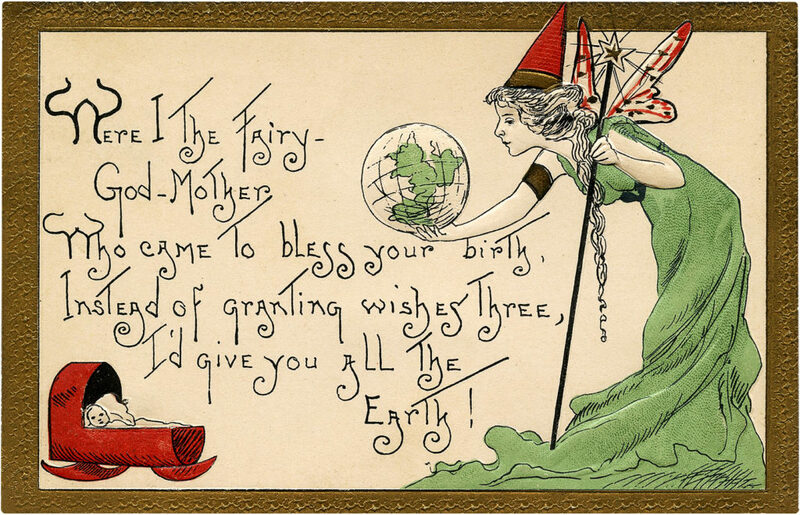 Today I’m sharing this Adorable Vintage Fairy Godmother Birth Blessing Postcard! This postcard is so cute. A fairy Godmother, dressed in a flowing green gown and red hat, holds the world in one hand and a staff in the other. Her transparent wings are red and black. There is a newborn baby in a rocking wooden crib. The blessing is a delightful poem. 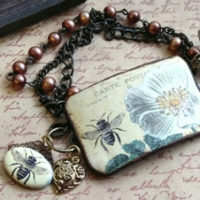 So nice to use in your Craft or Collage Projects! 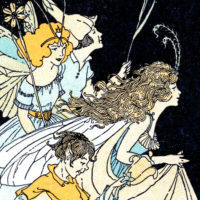 Vintage Postcard Mixed Media Bracelets – Design Team Tejae Floyde 2 Fairy Party Images – Vintage Style! Old Photo Woman in Wide Brim Hat Postcard Image! « Vintage Peach Roses in Wooden Wheelbarrow Image! Oh, how cool is this? I’ve never seen anything like this before. I love this image and the unusual font style which is so appropriate. Thank you so much!